With the agencies' recent doubling of the appraisal threshold amount to $500,000, commercial evaluations are a new-found opportunity for financial institutions to further reduce lending costs while also curtailing appraisal fees for borrowers on selected loan originations. Boxwood's FieldSmart commercial evaluations support nearly 200 clients nationwide and offer us a vantage point from which to recommend guidance to commercial banks on when and where to use this tool. Our advice is necessarily general and all-purpose since enthusiasm for employing commercial evaluations may vary substantially from one bank to another when accounting for individual lending specializations, CRE loan concentrations, geographical footprint, risk appetite and other factors like recent edits to existing internal policy. We begin with the two broad classes of collateral, i.e., investment or income-producing commercial real estate and owner-occupied commercial assets, and then drill down on our guidance within each category. Our recommendations are filtered by four additional considerations or factors related to the assets or loans: Complexity1; Location2; LTV; and Transaction Type3. As shown in the top section of the nearby table, we recommend the use of commercial evaluations for new loans under the $500,000 threshold involving non-complex collateral under two scenarios tied to location: i.e., in urban or MSA locations with LTVs under 75% and rural/non-MSAs with LTVs of 60% or less. The lower LTV of the latter scenario is suggested due to: (a) modestly higher risks associated with valuing properties for new loans in more remote areas. After all, Madison, NE (pop: 2,400) will likely yield much thinner market data than Madison, WI (pop: 253,000); and (b) as a result of the relatively lean market data in rural areas, traditional bank underwriting leans more heavily on the credit of the borrower than the value of the collateral. On the other hand, it makes sense to ratchet up the threshold amount to $5,000,000 without limitation for non-financial transactions like renewals, extensions and various types of periodic credit reviews where no new funds are issued to borrowers. In addition, unless there is substantial market instability warranting an appraisal, we believe the use of commercial evaluations at the $5,000,000 level will impose little collateral risk. Note that we propose this much higher amount on loan renewals because there is no specific agency guidance or dollar cap for using commercial evaluations on these types of transactions, and we have observed that many of our clients take advantage of this opportunity. In fact, the allowance for commercial evaluation use on larger loan renewals naturally increases the population of eligible portfolio loans which, in turn, creates the potential for bigger savings for commercial banks. We generally recommend the use of appraisals for complex properties (restaurants, gas stations, recreational and educational facilities, etc.) across the board, though from time to time we have successfully completed commercial evaluations on selected special use properties such as medical offices, churches and day care facilities that do not carry any significant Going Concern component. This second category is a bit more sensitive since, by definition, business owners must occupy at least 51% of the space in their facility. As a result, this situation opens the door for broader use of commercial evaluations under the premise that the primary source of repayment is generated by the owner's business rather than rental income from the property, and here again, banks will principally look to the borrower's personal and business credit rather than the collateral for repayment. 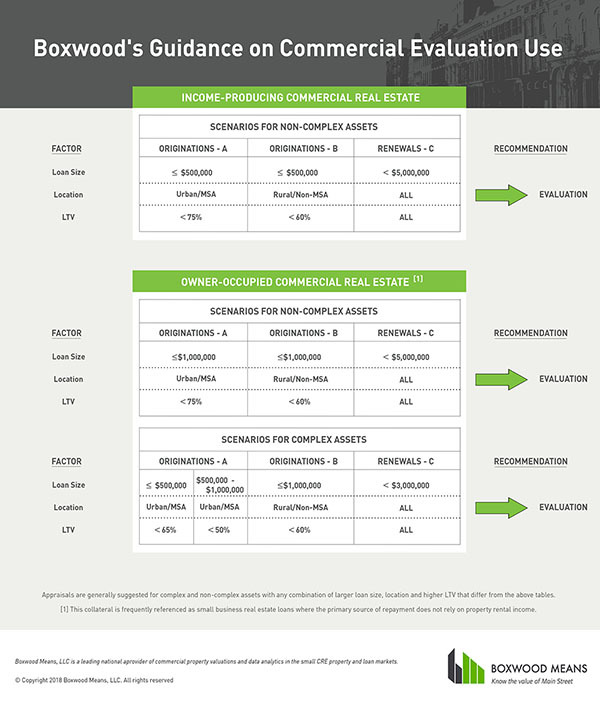 For that reason, we recommend commercial evaluations under scenarios for both non-complex and complex assets as the lower two sections of the table show. First, for the non-complex or typical property types Boxwood endorses use of evaluations on originations of small business real estate (SBRE) loans up to the regulated limit of $1,000,000 in urban and rural areas at LTVs of 75% and 60%, respectively. Regarding loan renewals and other types of non-financial transactions, we recommend using evaluations on loan sizes up to $5,000,000 assuming no significant changes in market conditions. Second, we take a more nuanced approach with complex or more atypical assets. For example, we stratify new loans into two separate dollar buckets for urban locations (Originations/Scenario A) and suggest utilizing commercial evaluations on SBRE loans below $500,000 with a maximum LTV of 65% but no more than 50% for bigger loans between $500,000 and $1,000,000. In rural areas, we suggest that a maximum 60% LTV is prudent for any complex collateral on a SBRE loan under $1,000,000 since, again, bankers will primarily rely on the financial strength of the borrower and his/her business cash flow for repayment. For renewals, we suggest $3,000,000 as the ceiling for all locations and LTVs to limit the possible exposure on these non-conventional, owner-occupied properties. Of course, commercial banks can devise a myriad number of ways to employ evaluations within their appraisal policies that keep safety and soundness uppermost among the banks' priorities. With 100+ years of collective institutional and private appraisal experience among Boxwood's staff, we believe the above guidance is a great place to start for any commercial bank that may be contemplating changes in use of commercial evaluations under the new de minimus level, or expanding use to enhance current operations. 1 Complex properties are atypical, often single purpose and, among other uses, may include: recreational purposes; educational; houses of worship; medical; senior housing; lodging; restaurants; and gas stations. Non-complex assets tend to involve conventional property types or non-specific uses. 2 Location is defined by two broad categories: urban and/or within an MSA; and rural or outside an MSA boundary. 3 Transaction type refers to financial (e.g., originations or any loan transactions involving new funds other than transaction fees) and non-financial or subsequent transactions where no new monies are extended (e.g., renewals, extensions, modifications, credit and portfolio reviews/monitoring, and REO annual reviews).